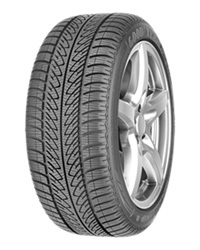 The Goodyear UltraGrip 8 is a winter tyre that provides quality handling on snowy, icy and wet roads and was named as an exemplary tyre in the 2012 winter tests by Auto Bild. Rather than asymmetrical tread, the Goodyear UltraGrip 8 has directional tread with saw-shaped central ribs which act like snowploughs to help remove snow and increase grip on the roads to maximise safety. Cars tend to use more fuel when travelling in wintery conditions but the UltraGrip 8 helps improve fuel efficiency and mileage.